We took immense care and used advanced technology to build a worry free product. 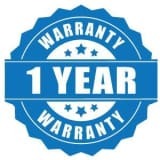 But just in case you have an issue, this product comes with an one year limited manufacturer warranty and amazing customer service. See everything in beautiful color and super clarity with this HD Wireless Security Camera. Install Camhi/Keye app on your Android/ IOS Devices. How many days of recording can come in 32gb card ? it can record 15-16 days of audio visual recording in a 32 gb card.It has auto delete feature which means you will always have last 15 days of recording even if the card memory gets full. How to clear the sd card if it is full ? Can I connect it with mobile network kept at home, through Hotspot and Monitor on other mobile through wifi ? Yes sir you can moniter. Whether 128gb micro SD card comes with the camera? Can it connect with mobile hotspot ? yes it can be easily connected to mobile hotspot, but you will need 2 phones at the time of Installation with hotspot. Is this product connects to JioFi. If yes, how it will connect by wire or wireless..? yes it can be connected to jiofi dongle, please contact support team for help. How will i used it when i away home? This product need internet connection?? Can this be mounted in car dash? No It does not rotate automatically. you can rotate it via your Phone. 128 GB SD Card Supported By Camera. 100 to 200 Meters Range of This Camera. No Memory Card Does Not Come With Camera. Need To Be Purchased Seperately. I brought one camera ,Which app I will dounload ? Ami one ps kinachi but cemara r nicheta vangha... Tai fitting hoche na. Kindly respons me. Install korta parchi na. am i have give it an internet connection from other sources or it has it's own network connection. You Need To Give WIFI Connection. No It Does Not. Wifi support 2.4 gh. Or 5.0gh. Outdoor use this camera ? Yes Under Some Shades, Not Directly Below The Sky And It is Not Waterproof. Is it working in slow internet connection. Yes It is Working In Slow Internet Connection.